A late rally by the Eagles in the bottom of the sixth procured the victory over the Cougars. 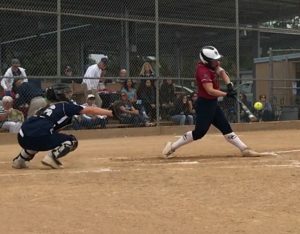 Steele Canyon had the first crack at scoring when Bianca Morales (1-2, 2B) led off the top of the second with a double. 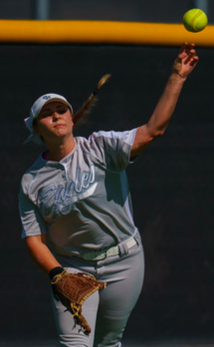 However, she wouldn’t be advanced any further as Catie Dobbs struck out the next batter and retired the final two via a ground ball. Moving along to the bottom of the sixth inning as both teams pitching shut the others’ offense down. In the bottom of the fifth McKenzie Boehm (2R) led off the inning reaching on an error, a couple batters later Julia Tyseling (1-2, R, RBI) walks, Rylee Omahen (1-2, RBI) sacrifices both Boehm and Tyseling up to second and third, Bailey Wallace is intentionally walked to load the bases and Brooke Bertussi draws a two-out walk which brings home Boehm to make it 1-0. Now trailing 1-0 heading to the top of the sixth the Cougars knew they were running out of opportunities. Leadoff hitter Marley Rimoldi (1-3) lined a single to right field, Danelle Directo (RUN) into run, Elizabeth Bott sacrifices Directo to second on a bunt, with one out Tayler Thomas (1-4, R, RBI) singled to right advancing Directo to third base, JJ Venzor (RUN) is intentionally walked to load the bases. Next up was Audrey Bagge (1-3, R, 4 RBI, HR) who was hitless against Dobbs and on a 1-0 county promptly crushes the offering over the center field fence for a grand slam which gives the Cougars a 4-1 lead. The four-bagger by Bagge brings everyone on the Cougars side to a loud roar of cheers. Audrey Bagge connects on a grand slam on Saturday. After the next batter, Bianca Morales is hit by a pitch, Granite Hills coach Curtis Barnes comes out and makes a pitching change to the lefty Staci Chambers. Chambers is able to get out of the inning despite giving up a walk. Heading to the bottom of the sixth the Eagles now knew they had to make something happen or their season was over. Leadoff hitter Chambers (1-2, 2B) smashes a double to right field for the Eagles first hit of the game, Aylani Ottley in to run, Amaya Esparza hit a ball that was misplayed which allows Ottley to come in to score to cut the Cougars lead 4-2. The next batter Boehm reached on an error that allowed Jenna Humphries to move to third base, Sydney Huse laid down a squeeze bunt that scored Humphries (RUN) to make it 4-3, Tyseling roped a double that scored Boehm to tie the game 4-4 and Omahen followed with another double to bring in Ottley to give the Eagles the 5-4 lead. Now trailing 5-4 the Cougars were down to their final at-bats, Chambers got the first out as Rimoldi grounded out, Bott bunted and reached on an error, Thomas grounded out which advanced Bott to second and Venzor grounded to Omahen at short who threw the ball and it looked like a close play as maybe Venzor had beaten the throw but she was called out. For the Cougars, Grace Richter went the distance in the loss in which she gave up 5 runs on 3 hits while walking 5 and striking out 2. Starting the game for the Eagles was Dobbs who tossed 5.1 innings giving up 4 runs on 4 hits while walking 2 and striking out 6. Chambers got the win as she came in relief tossing 1.1 innings giving up 0 runs on 0 hits while walking 1 and striking out 1. The win by Granite Hills (24-8) was the fifth of the season over Steele Canyon (19-14). The Eagles will now take on Scripps Ranch on Tuesday at home at 3:30 pm.